About four years back, Vilva Natarajan realised that Karomi, a document management and workflow automation company he had founded, had hit a plateau. The issue was how to grow the business and take it global. Vilva used to attend TiE conferences and recalls gingerly approaching Raghunandan, an entrepreneur himself and a speaker at TiE and now a director on Karomi, for advice. Raghunandan, says Vilva, felt Karomi was all over the place and needed to focus. Karomi, an IT products company, was primarily looking at compliance at a broad level. They decided to stick to the same theme, but focus on three industries – pharmaceuticals, food and beverages, and cosmetics. These three sectors, says Vilva, are evergreen and they have a large number of multinational and domestic companies. Karomi was working with a clutch of companies in these sectors and it only had to extend its relationship with them, for a different product. 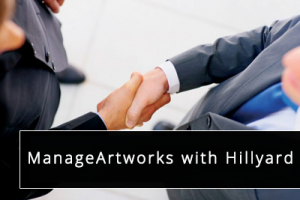 The company had also by then done a few projects in the area called artwork management, an area that is quite often ignored, says Vilva. Artwork management is basically about managing the packaging of a product. “If you look at a package,” says Vilva, “there is tonnes of information – graphics and colour, text, a majority of which is based on regulation.” The font size, barcode, ingredients panel and what should be included in that, date of manufacture, use by or expiry date, warning symbol, recycle symbol, and many more such are all mandated by various regulations. The font size will vary depending on the pack size. Each of the elements on a package has to be in a particular place. On top of these regulatory requirements, each company will have its own branding requirements. At least half a dozen departments are responsible for the contents of a package and when it comes back from the designer, each department will check for any changes made. This means that the design will go through several departments, each of which will send in its corrections or changes by a PDF file over email to the designer, who then has to integrate all of them before the package is sent to the printer. The whole process can take as many as 70 days. So, even if, say, a cosmetics company or a pharmaceutical company increases its manufacturing capacity, the product can be launched in the market only after the package is ready. 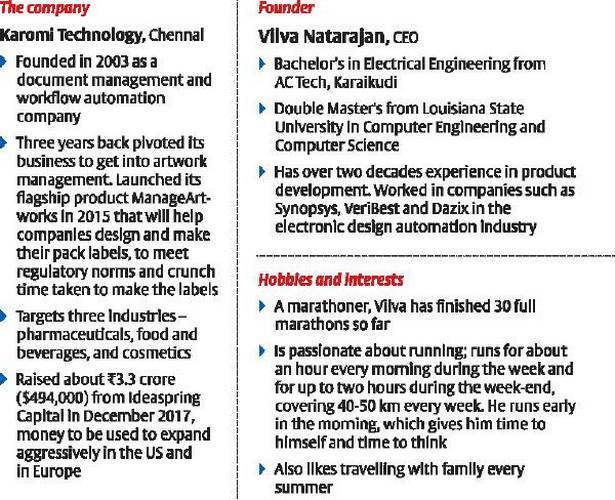 Companies, says Vilva, are eager to crunch the time taken to launch a product. “That is where we come in and say how can we crunch it,” says Vilva. Karomi launched its flagship artwork management product ManageArtworks in 2015. “We have had people who take 70 days and say they want to crunch it to 30-40 days.” That is, by the time they kickstart the packaging process to the time it goes to the printer, bring down the time taken so that it reduces cost and also gives them competitive advantage. Whatever the product, it is often the packaging that keeps changing. If it is a consumer goods, the packaging has to be attractive enough to catch the buyer’s eye while making sure all the regulatory requirements are taken care of. Karomi’s product, available on the cloud, helps companies put together all the elements of the packaging in one place and each department can make changes or corrections through an annotation tool and the different versions can be uploaded. The system automatically manages version control and, so, companies can have any number of versions of the same art work, check and compare the different versions. The product also helps companies check whether all the statutory requirements are met. “Our system will compare the versions and tell you where the changes are,” says Vilva. This helps companies catch more errors and ensure greater compliance and do it much faster. “Applications like this dramatically reduce the time and improve the accuracy of what you are shipping out,” says Vilva. Karomi raised about ₹3.3 crore from seed stage venture capital firm Ideaspring Capital in December 2017. The money was used to enter the US, which is the biggest consumer market. “We are going all out in the US market,” says Vilva. It is working with partners in Europe, Australia and Brazil. Karomi is also looking to address the retail industry in Europe, which is large and one that has plenty of private labels. All these private labels too have to meet regulatory requirements. Vilva says Karomi’s focus for the next six months or so will be to grow aggressively in the US. Major regulatory changes are happening in the US and Europe, which means there will be great demand for packaging artwork. About 80 per cent of Karomi’s clients are in India and the balance outside. But Vilva sees the overseas customers contributing more once the US and European businesses pick up pace and grow. Karomi will also look at a Series A funding round of ₹20-30 crore in the next six months.